Like all true Italian cooking, Sicilian cuisine is intensely regional. Sicilian Seafood Cooking takes readers on a culinary journey around Sicily, using seasonal produce and traditional cooking methods and techniques. The book is layered with fascinating information about the origins of recipes and information about sustainability issues. Sicilian Seafood Cooking is lively, authoritative and attractive collection of 120 traditional recipes for seafood and its accompaniments—including a great variety of first- and second-course dishes, food for feasts, special sauces and delicious vegetables. Marisa devotes an entire chapter to the classic Sicilian dish, caponata, with no less than nine different recipes. 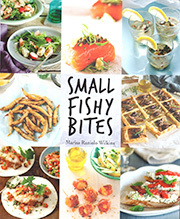 Sicilian Seafood Cooking (Marisa Raniolo Wilkins) is now available in paperback (January 2015). The paperback edition has been printed on quality paper and the colours of the photographs are as vibrant as in the hardback edition. 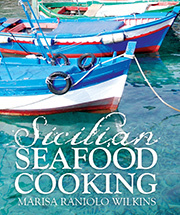 The first edition of Sicilian Seafood Cooking (November 2011) was printed in hardback and is now out of print. Both editions printed by New Holland Publishers.